Be sure to mark your calendar for the Florida State Parks on the Air contest! Whether you are a casual operator, contester, in Florida, out of Florida, or even outside the United States, this contest is for you. This is a two day event, on the first full weekend every April. Operating time is from 1400 UTC to 2200 UTC ecah day, Saturday and Sunday. Most Florida parks open at 8:00 AM local time, and close at sundown. The operating time period of 10:00 AM – 6:00 PM (local) should allow time to enter the park, set up a station, operate, and tear down in time to leave before park closing. See the rules page for more details. In the time leading up to the contest – please, get out and operate from our State Parks! One way to do this is by participating in our Worked All Florida State Parks awards. We don’t have any type of official agreement with the Florida Department of Recreation and Parks (FDRP), so the more we get out there operating, always courteous and respectful of the rangers, wildlife, and other visitors, the more fun we will have on contest day. Be polite, follow park staff instructions, and don’t hesitate to demonstrate ham radio to curious onlookers. 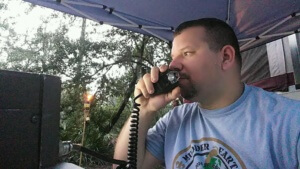 Show them that this is another way that we can get out and enjoy our Florida Parks – you just might spark an interest in ham radio for your visitors! Share what you’ve learned about potential operating locations and conditions on the Yahoo Group, and send in photos of your adventures so we can share them here and through our social media channels. Provide a venue for Florida amateurs to get out and enjoy operating in the great outdoors. Florida has an award-winning State Parks system featuring more that 170 park sites, including cultural centers, archeological digs, Civil War-era forts, wildlife preserves, and recreational areas – not to mention beaches! Be sure to visit floridastateparks.org for more information on camping, educational materials, park maps, and a complete list of parks organized by region. There is also an excellent GIS map of all the park locations available online courtesy of the Florida Department of Environmental Protection. This is where a lot of the planning and up-to-the minute information about the contest well happen. Members can discuss planned activations, and exchange ideas about ways to make this event a success not just here in Florida, but across the worldwide ham radio community. If there’s anything we can do to make it better, let us know! Our primary sponsor is K4LKL, the Lakeland Amateur Radio Club, located in Polk County Florida. See the rules page for details on the special K4LKL multipliers that will be active during the contest! A big thanks goes to the good folks who run the Ohio State Parks on the Air event, they provided a lot of helpful information and ideas on making this event a reality. Check them out if you haven’t already.